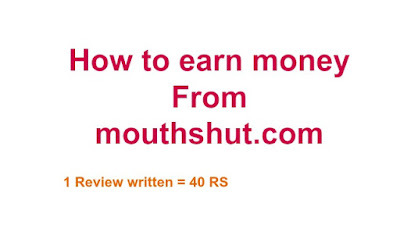 Sasbe pehle Aapko Apne browser me www.mouthshut.com type karna hai, Yes friends, www.mouthshut.com jo hume Products ke review ka paise deti hain, Aapko iss website par sign up karna hain and apni profile fill karni hain. Positive review me Aap Jab browse category me jaaoge to aapko waha par bahut saari products category show hongi aapko kis product par review dena hain waha se category select karni hain Aur us product ke Advantage and Features ke baare me share karna hain. 1 MS point = 1 RS. it means 20 MS point = 20 RS. me share karna hain Aur Sabse Achhi Baat ye hain ki Negative Review ke Aapko 40 MS point milte hain. Sabse pehle aapko dashboard par jaana hain Aur Cashout ke liye Aapke paas 500 MS point hone chaahiye Uske Baad aapko dashboard ke left side me 'MS Point' ka option hain Us par click karna Hain Aur Aapke MS point show ho Jaayenge Aur Uske Just Right me Encash MS point ka option hain waha se aap cashout kar saktein ho Aapne bank account ka numbet dena hoga jisse balance aapke bank account me transfer ho jaayein.